One of our students, Corrine, has written an excellent blog post all about the relationship between professional and amateur archaeologists. In increasing regularity archaeological excavations consist of a mix of archaeologists and volunteers. In our site volunteers make up a vital part of the team, the benefits of volunteers may seem rather straight forward, people working for you for nothing and they want to be here so they can’t complain (as much). However the value of individual volunteers is largely dependent on their experience, our volunteers have a range of experience from having little to no experience and simply an interest in archaeology and the history of the local area, to vast experience in digging in the UK and abroad and a long history of working within the archaeological community. We should also be careful about using the word amateur, it can be rather patronising, the term amateurs encompasses local societies such as the Chichester archaeological society, many of which are run by ex-archaeologists or those whom have an interest in the subject, so we will call them volunteers. 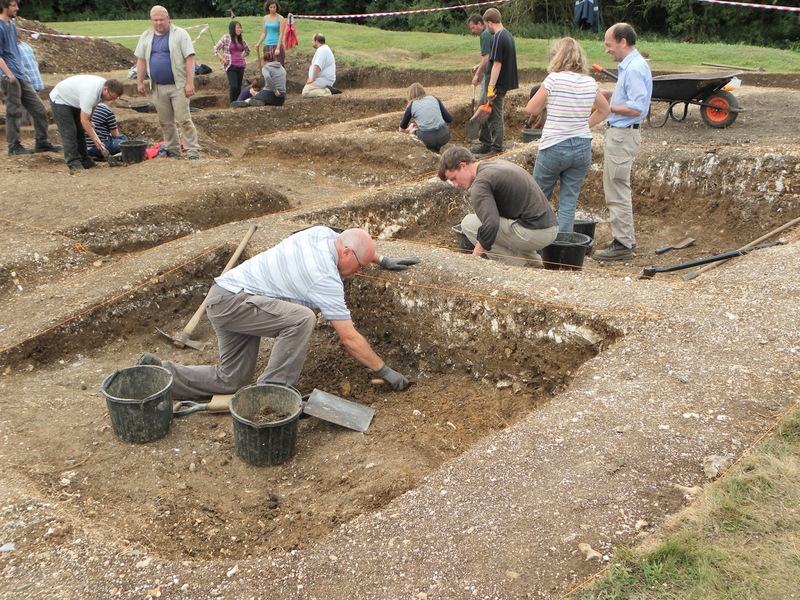 Societies have been used more and more for the running of museums and other non-excavation sides to the world of archaeology, for example Fishbourne Roman Palace is run by the Sussex Archaeology society. These jobs are better suited to those who have less of an understanding or interest of the practical side of archaeology. The value of volunteers and societies running these sites is mainly felt in monetary terms, whereas professional archaeological activities are affected by the need to generate money usually through research grants and with the loss of funding volunteers are becoming a vital cost cutting commodity. There is an argument for the necessity of having a largely professional archaeological team as opposed to volunteers on excavation as it is much cheaper but Chris Elmer, a PhD student who remembers the sixties and general all round boss, illustrates some of the issues with this. Analytical skills of amateurs will not be as incisive as their professional counterparts, for example how items are used and applying theories to objects. Societies can also afford to focus on parts which their society have a particular preference for, their increased presence in archaeology will also have an effect on those looking for jobs in the field and can be detrimental to the development of archaeological community. Speaking to volunteers on our dig we have a wide range of skill sets, for example Briony one of our volunteers has a MA in organisational development and also has a certificate in Archaeology, her input in the site has been as helpful as the site supervisors. Briony instructed Sam, a student at Southampton University, in defining the edges of the trench, and in identifying changes in the stratigraphy which was less clear to untrained eyes. With this experience and skill as a volunteer she is invaluable. However you cannot guarantee or even accurately estimate the skill of individual volunteers, many come with little or no experience, while these people are important in an excavation they are more limited in what they can do than those with more experience. And despite Briony’s vast experience it is of her opinion that digs would not be effective without professionals on site to lead the dig, and make everyone aware of what they aims of the dig are. Volunteers such as Briony are vastly helpful when working with students, an experience she says she enjoys, as they are often more readily available to give help and direction to students. Eden Eady a Southampton Archaeology and History undergraduate believes volunteering creates a level of respect from students. This is not to say that volunteers with no experience are of no use, to become experienced volunteers they must start somewhere. Speaking to Lucy a fine art student volunteering at the Basing House excavation, who has no previous experience, she feels she has been useful and followed direction where it was given. When she felt her knowledge was too limited for certain things there were plenty of people to ask who were happy and helpful to guide her. Dr Jude Jones, resident finds and medieval extraordinaire, reflects on the changes in attitude towards volunteers, rather than seeing amateurs and professionals as separate groups working in the same sites, she highlights the drive towards communal archaeology, and that the idea that professionals are superior has become largely outdated. The division of volunteers for digging and professionals for interpreting is largely outdated now as academics realise the importance of carrying out fieldwork themselves. Talking to Dave Allen co-director about the value of inexperienced volunteers he illustrates the problems this presents, such as lower expectations and more time and patience required to teach things that anyone with a history of archaeology would already know, he was however keen to impress the importance of volunteers on many digs and that the variety of skill sets can be put to work on almost any dig not dependent on previous experience. Perhaps the solution to this is rather obvious, we can a) stop paying everyone for excavation including professionals and expect everyone to do it out the love they bare digging, or b) allow for greater education and communication between amateur archaeologists and professionals in order to create a professional amateur workforce, which is probably more realistic.